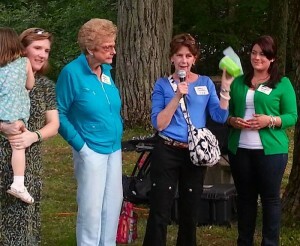 Erin (right), with Ben’s mom Cathy (2nd from right). NEW BRITAIN — The beat will go on for Ben Cheney’s family and friends. Cheney, who had a love of music and played drums in the New Britain High School band, died in a car accident in February 2012. For the second year in a row, those who knew Cheney best will sponsor a dinner and concert fundraiser to benefit the NBHS Golden Hurricane Marching Band. Cheney was so fond of what the band stood for, he came back to the school after graduating in 2008 to work, volunteer and to mentor young students. Cathy Cheney called her son “a band geek” and said she expects a big turnout for the event. “We hope to raise several thousands of dollars,” she said. The money will go toward operating expenses, instrument repairs and uniform accessories, according to David Kayser, NBHS band director. According to Erin Stewart, a longtime family friend of the Cheney’s and one of the event organizers, the buffet dinner with pasta will run from 5 to 7:30 p.m. June 15. There will be entertainment during dinner and several groups will perform, she said. There will be an after-party beginning at 7:30 p.m. which will have five musical acts. “The music will range from Irish folk to new wave and rock,” Stewart said. The price to attend is $20 for those who come for the dinner and show and $10 for those who just come for the show. Participants can pay at the door. Last year, Stewart said, $20,000 was raised.